I am a huge fan of Cantonese-style polobao, or pineapple bun, so named not because of its flavor, but because of its appearance. The delicious sugary, buttery crust on top resembles the texture of a pineapple. During my second visit Hong Kong this past summer, I immediately sought out the best pineapple bun in the city. Two names consistently popped up: Kam Wah Bakery and Kam Fung Bakery. Kam Wah Bakery is on the Kowloon side in a bustling shopping area called Mongkok. Kam Fung Bakery is on the Hong Kong island side in Wan Chai. 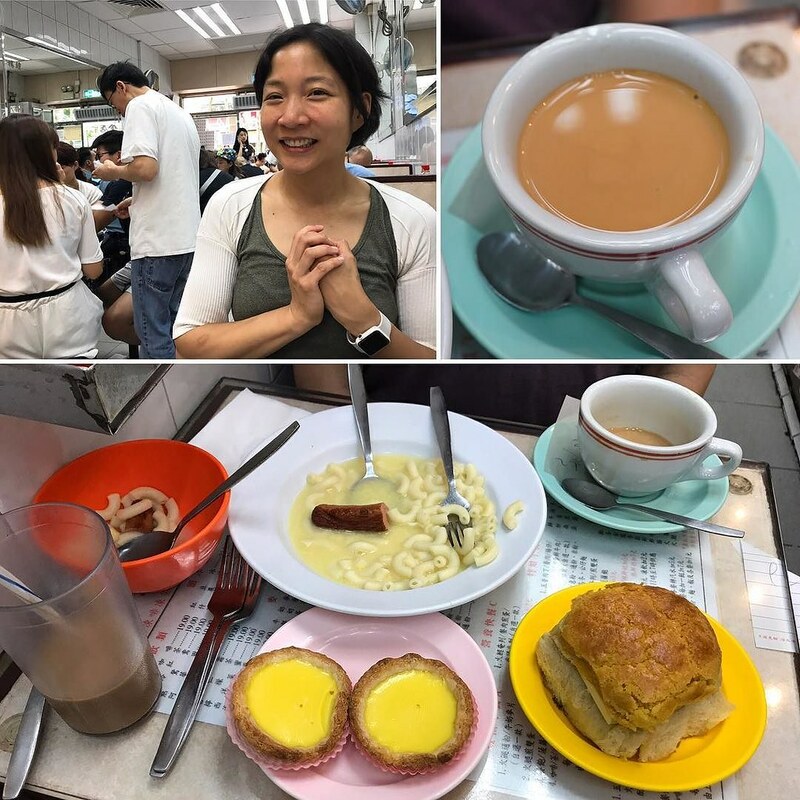 Because we were planning to spend the day on the island side, we decided to stop by Kam Fung Bakery early in the morning (heh, around 9AM) for some traditional Hong Kong breakfast. Kam Fung Bakery is located about a 3-5 minute walk from the Wan Chai MTR station. It’s flanked by traditional local Chinese shops on one side and the fashionable pedestrian-only Lee Tung Avenue right round the corner. More likely than not, there will be a line out the door. We waited maybe 15 minutes before being seated. The place is small, but turnover is reasonably quick. We decided to go all out and order several classic Hong Kong breakfast items. Pictured above: macaroni soup (chicken broth) with sausage and an overeasy egg. This British-influenced breakfast is very Hong Kong. Variations include subbing out the sausage for ham and cooking the egg in a different style. My friends who grew up in Hong Kong call it comfort food. It reminds them of their childhood, and they crave it when they miss home. Of course I had to get my pineapple bun. The quintessential way to eat this type of bread in Hong Kong is to order it with an ice cold thick slab of butter. They call it poloyau, and it’s fantastic! I love the contrast of the slightly warm bread with the ice cold butter. It’s so good! Hong Kong breakfast is not complete without Hong Kong milk tea. I tend to prefer it hot in the morning, but you can get it either hot or cold. The strong black tea is served with evaporated milk and you can optionally add sweetener if you want (I like it better a bit sweetened). I’d also encourage you to try yuānyāng, a 50/50 tea and coffee blend with milk. It’s surprisingly good. We learned after we arrived that the egg tarts would not be ready until 10AM. We decided to start eating everything else and put in an order for the hot, freshly baked egg tarts right at 10AM. Ahh, it was delicious. There’s nothing like a freshly baked egg tart. Soooo good. It was a filling breakfast. I loved the pineapple bun, and it was definitely interesting to try the traditional macaroni soup breakfast. I’m not sure it’s my favorite thing to eat in the morning, but it was fun to try. The Hong Kong milk tea is very good here, and the egg tarts are excellent. The vibe feels very authentic and very local. I love it. I definitely recommend this place!